The new look BMW X3. EVOLUTION rather than revolution will drive the new BMW X3. Revealed ahead of its debut at the Geneva motor show in March, exterior changes appear to be minimal with modified twin circular headlights (LED headlights are optional), a more eye-catching kidney grille, new front and rear bumpers, and exterior mirrors with integrated turn signal indicators. The headline inclusion is a new 2.0-litre four-cylinder turbo diesel engine. It is forecast to be part of a four-diesel, three-petrol engined X3 stable. Whether Australia will get all engine choices is still to be finalised, as is pricing. Weights have increased slightly, but BMW has included more technological kit in the latest model. Expect improved quality in leather seat trims, a new high-gloss black panel to hide the climate-control air-conditioning system and a touchpad controller. 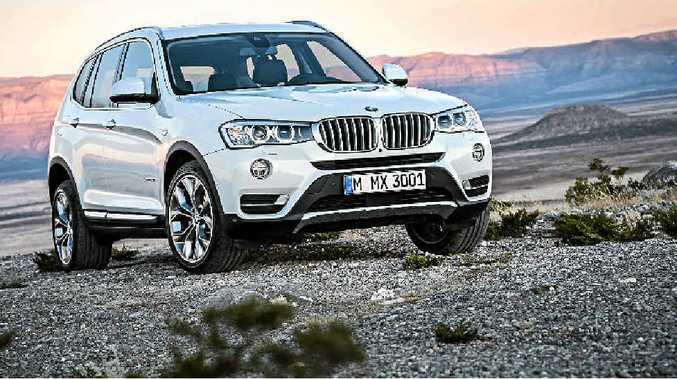 The new BMW X3 is forecast to go on sale mid-year.